Try Our Friendly & Insured House Cleaning Logan. 100+ 5 Star Google Reviews. Our cleaners deliver WOW results in your home and our Customer Service team delivers the best customer service in Australia. This is fundamental to our identity. We’re here to chat 7:30am – 7:00pm Monday to Friday, 8:00am – 5:00pm Saturday. We have very high expectations for our cleaning partner and get feedback from you on every clean they do. Unlike others in the industry, we also believe it’s non-negotiable to make their lives easier and pay them fairly. You can feel good about hiring a Maid2Match cleaner. Delivering a single 5 star experience is not difficult. Consistently and regularly delivering the same 5 star experience across thousand’s of home is. We have a 73 point cleaning checklist for our regular homes to ensure we are always hitting the mark. BOOK THE BEST CLEANERS TODAY! Percy is Maid2Match’s biggest fan! He loves that he can book his clean in just 60 seconds and not have to worry knowing his dog house is being cleaned by insured and vetted cleaners. Try out the Maid2Match service and see if you agree! Maid2Match provided a team to clean our home from top to tail. Bookings were easy. customer service center was responsive. The team confirmed the details before arrival. They had all their own equipment and arrived on time to do the most thorough cleaning job in our house EVER. They also assisted with laundering and folding that most other cleaners would never touch. They work hard and we highly recommend them. Great value cleaning- a worthwhile investment. Our cleaning team (Team Venus) are very friendly and also considerate of our cats. Easy payment system, great communication, user friendly website. Wonderful company. The team were amazing and did a fantastic job. They worked really hard and cleaned areas and appliances that I never thought would be clean again. After nearly 20 years in this house and to have it looking pristine at sale time is all attributed to the maid2match team. Thanks to you!! Much appreciated!! We understand that everyone has a unique situation, and our flexible cleaning crew can adapt to whatever cleaning conditions you require. Customers enjoy the personalised services Maid2Match can provide, but there are plenty of other benefits that come with it. Our partners go into every job not with the goal of just getting another clean done, but aiming to blow you away at the pristine condition they leave your apartment in! 5,000+ jobs under our belts, we are ready to go and knock your socks right off. 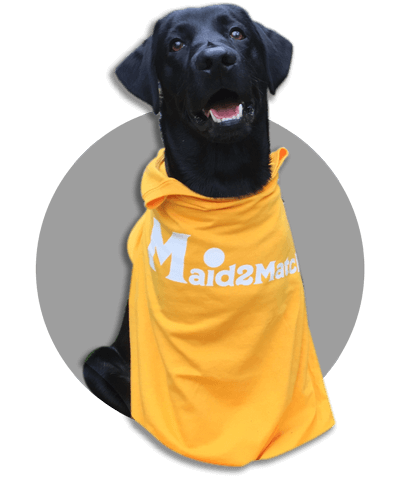 Use the cleaning service that cares – Maid2Match! Why Should You Hire A Residential House Cleaner? Hiring a house cleaner is beneficial because it can significantly reduce stress levels by freeing up a lot of your personal time that can be better spent elsewhere. Having a neat and tidy home is invaluable and ensures that you won’t be rushing to tidy up when an unexpected guest arrives. The additional free time that is brought on by cleaning gives you the chance to dedicate more of your valuable time to more important activities, like work or spending quality moments with family. Even if it’s just an additional chance to relax, every extra minute at your disposal counts!